Bales are picked up with four bale wagons. Bale size is important and adjusted on a regular basis. Geralds likes to bale his alfalfa- orchardgrass fields between 12 and 15 percent moisture. Each of his six balers is equipped with a moisture tester. “In the horse market, there’s little tolerance for dusty or moldy hay,” Geralds said. Just stay on Cave Hill Road and you’ll see us baling on the left side, just past the old barn,” relayed Clayton Geralds, as I wound my way through the rolling hills of south central Kentucky. As far as finding a farm goes, this one was easy. In the distance, three New Holland self-propelled bale wagons chugged along as they gobbled up the evenly spaced rows of small square bales left by Geralds’ fleet of balers. This was just the start of a typical big baling day at Geralds Farms where 7,000 to 10,000 bales find their way to the pole shed if weather conditions permit. Geralds’ story begins in 1982 when he started his farming career milking 40 cows and growing a little tobacco on a rented farm. The only forage grown helped feed the farm’s livestock. He attended an alfalfa conference during 1983 in Cave City, Ky., and what he heard there convinced him to seed down 100 acres of alfalfa. “I never looked back after that,” Geralds noted with a wry smile. The milk cows departed in 1988 and Geralds along with his wife, Molly, bought their current farm in 1997 — 200 acres with no buildings. Since that time, both buildings and more acres have been added. These days, Geralds and his son, Christopher, work full time on the farm and grow 720 total acres of hay crops: 540 acres of alfalfa-orchardgrass mix, 120 acres of timothy, and 60 acres of alfalfa. Christopher also runs a small herd of beef cattle. For the most part, this farm is all hay, all the time, and Geralds has mastered the process of turning small square bales into a profitable enterprise. With no annual crops grown to break the alfalfa rotation cycle, Geralds has perfected a system to keep acres in forage production year after year. These alfalfa-orchardgrass fields are the backbone of the operation. Geralds uses a late-maturing orchardgrass variety that complements alfalfa maturity. He also demands 0 percent other crop seed in the orchardgrass seed he buys. 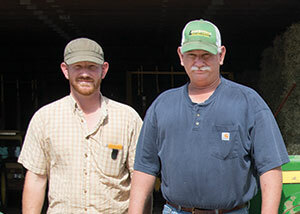 Geralds has the Kentucky Department of Agriculture come to his farm each month to test any recently baled hay lots. “My customers don’t always ask for a forage quality test, but if they want it, I’ll have it for them,” he said. During the final production year of alfalfa-orchardgrass, Geralds sprays the stand with glyphosate (Roundup) after second cutting and seeds the field down to timothy in the fall. The pure timothy fields stay in production for one or two years. They are usually the last to get harvested, generally during the end of May when the plants have a 2- to 3-inch seedhead developed. “Our customers demand weed-free hay, so we’re vigilant about keeping fields clean,” Geralds asserted. “We seed Roundup Ready alfalfa so that fields can be sprayed with glyphosate before the orchardgrass is no-tilled back into them. We also spray every acre with Prowl H2O (pendimethalin) in the spring to keep new weeds from germinating,” he added. At the time each spring when herbicide is applied, Geralds also sprays for alfalfa weevils, which in bad years can defoliate an alfalfa crop if left unchecked. “Replacing soil nutrients is a priority on this farm,” Geralds noted. “We soil test every year and compare the results to the previous soil analysis. You can’t grow good hay without adequate soil fertility,” the National Hay Association board member added. The farm has its own straight truck equipped to spread dry fertilizer. That truck is usually out in the field soon after the last load of bales is picked up. 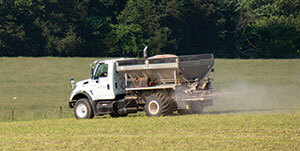 Fertilizer is applied in two separate applications over the course of the growing season. The standard single application rate for the alfalfa-orchardgrass stands is 30 pounds of nitrogen, 20 pounds of phosphorus, and 150 pounds of potassium per acre. Fertilizer is generally applied after the first and third cuttings. Pure alfalfa fields, which are cut four or five times per year and yield about 7 tons per acre, receive the same fertilizer treatment as the mixed orchardgrass stands but without the additional nitrogen. Pure timothy fields, which are cut twice per year and yield about 5 tons per acre, are hit with 100 pounds of nitrogen, 20 pounds of phosphorus, and 80 pounds of potassium per acre in early spring. They receive an additional 50 pounds per acre of nitrogen after the first cutting. In addition to fertilizer, Geralds’ fields receive 2 tons per acre of lime every other year to keep soil pH at a level for maximum alfalfa productivity. Loading truck vans with small square bales is a totally mechanized operation at Geralds Farms. The average customer buys 20 to 25 van loads per year. With 130,000 to 150,000 bales to make each year in a humid environment, there’s no leeway or tolerance for machinery delays. After years of experimentation, Geralds has developed a system that fits and maximizes efficiency. To make it all happen, he owns two 17-foot New Holland self-propelled disc mower-conditioners, six John Deere balers, four New Holland bale wagons, four Enorossi Y-type wheel rakes, and three Krone tedders. He also maintains enough tractors to keep all the balers and one rake operating at the same time, if needed. Through the years, Geralds has learned that buying new equipment and then trading after several years of use serves his system best. For example, balers are traded every four years on a rotating basis. Each baler is completely cleaned and checked for worn parts each winter. When it comes time to trade one, the value is usually at the top end of the market. Such a strategy has proven to both reduce downtime during the season, but also keeps annual repair bills to a minimum. Each baler is equipped with a moisture tester, so operators are expected to alert Geralds when bales are getting too wet. “We like to keep alfalfa bales between 15 and 18 percent moisture,” the haymaking veteran said. Geralds noted that he doesn’t like to use any hay preservative because he caters to a horse market that has little tolerance for dusty or moldy bales. He’d rather just make sure the hay is dry enough where bale deterioration during storage is not going to be a concern. For timothy, that means under 13 percent moisture. His alfalfa-orchardgrass hay is baled between 12 and 15 percent moisture. When untimely rain occurs, Geralds has a round baler and in-line wrapper that he puts into action. That hay is then used to feed Christopher’s beef herd. Each small square bale is made with 14 strokes of the plunger. The grass bales weigh 60 pounds while the alfalfa bales scale 70 pounds. Bales have to be 35 inches long with a tolerance of plus or minus 1 inch. Uniform bale size is needed to ensure tight stacks and for shipping. Geralds, who usually runs one of the bale wagons, watches to make sure that bales fit the size criteria needed to properly load a semi-trailer van. Each baler runs its own color-coded combination of twine so if one of the balers is off he knows where the correction needs to be made. To make it all happen, Geralds said he’d been fortunate to find good employees. “We have several retirees and high school kids who work for us,” he said. “They all know what it takes to get hay made and that some days are going to be longer than others.” In addition to Geralds’ son, Christopher, his daughter, Kimberly, is often available to run one of the balers. Geralds is a stickler for maintaining optimum soil fertility. He owns and operates a spreader truck that is put into action soon after bales are removed. Most of Geralds’ inventory is brokered to horse farms and retailers both in and out of state. His biggest customer is in Georgia. Hay prices are set in May and September. Harvesting hay is not the only mechanized component of Geralds’ system. Through the years he has developed a method to load the semi vans. Using a front-end loader mounted with an accumulator, bales are piled on a flatbed trailer one layer at a time. The flatbed sits directly behind the open van doors. On the opposite side of the van, a skid steer operating on the flatbed trailer and equipped with a vertical steel frame is used to push a six-layer pile of bales into the van (see photo). This is repeated until the van is full — no hand labor involved. 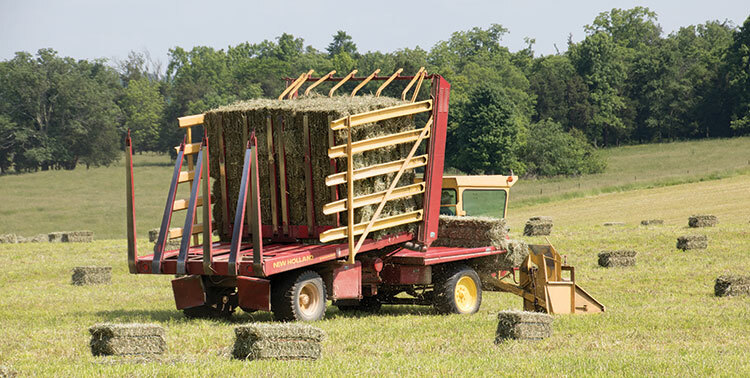 In the forage world where small square bales have essentially become a niche market, there are still a few producers like Geralds who have stayed the course and now cater to markets where small hay packages are needed in large quantities. He has also done his part to serve the industry in a variety of roles, most recently as a member of the search committee for a new Kentucky extension forage agronomist. Geralds has been active in the Kentucky Forage and Grassland Council, American Forage and Grassland Council, and the National Hay Association. He has also hosted numerous educational events and farm tours. This article appeared in the January 2017 issue of Hay & Forage Grower on pages 22,23, and 24.